As the air gets crispier it is time to head over to the hills and experience at least a weekend of proper winter. Campfire nights, the sound of rustling leaves, and the hot beverages that accompany painfully beautiful sunsets – these are the experiences that will liven up the soul and refresh even the most tired of minds. With a self driven car, a bunch of friends, and a good travel playlist, a road trip to the mountains near Bangalore will be an unforgettable experience. Here are some recommendations for those who seek a holiday in the clouds. Also Read: Why Traveling is Beneficial For Everyone? 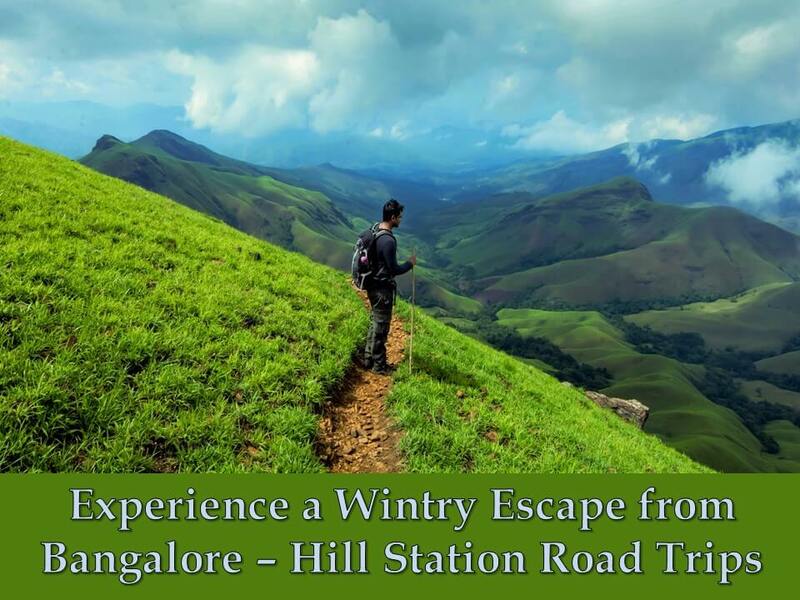 It may not be as high-profile as Ooty and that can be the exact reason why Kodaikanal attracts its own set of travellers and nature enthusiasts. The town is situated at a giddy 2133 meters above sea level and the landscape ranges from lush forests to smooth alpine-like meadows. The sight rolling mountain ranges accompanies visitors wherever they proceed in Kodaikanal. The star-shaped Kodaikanal Lake is one of the main attractions here while those who fancy a quintessential hill station stroll will enjoy the Coaker’s Walk. The Shembaganur Museum of Natural History is another enlightening landmark where one can learn about the indigenous Palaiyar community that calls these mighty mountains home. Bangalore to Yercaud is a 230-km journey via the NH44 and it entails a climb into the scenic Eastern Ghats. One can come here for a reclusive weekend with a book and some hiking gear. It is also got a good share of family attractions – the Anna Park and the tranquil Yercaud Lake are prominent landmarks. The Kiliyur Falls is a resplendent sight post monsoon and one can head over to Pagoda Point for that archetypal hill station experience – the ‘viewpoint’. The undulating and verdant hills of Vagamon are a soothing sight indeed. This town and the surrounding area is all about the scenic beauty – the manicured tea gardens, the mist-shrouded forests teeming with wildlife, and the spectrum of colourful flowers and extremely rare orchids. This Kerala town is also known as a hub for paragliding. Honeymoon Cave, Marmala Waterfalls, and Moon Hill are natural sites worth a visit. There are many local legends associated with the natural attractions and formations in Vagamon, adding an extra bit of fun to the entire experience. Travellers who want an uncompromised experience look to travel on their own. Renting a car is better as it assures complete privacy and there is more space. It is also pretty easy to find a good car rental Bangalore has the best choices. App-based Zoomcar allows registered customers to book a car in a few seconds. They can choose from the latest and most popular car models from cozy hatchbacks and impressive sedans to sturdy spacious SUVs for those group trips. Apart from the chance to drive the coolest cars, one also enjoys extra benefits with a top rental. 24/7 on-road support is something even car owners cannot boast about and since each car is GPS-enabled, it is a secure way to travel.